For most vet practices, rewards programs are no-brainers. In a study we conducted, 77% of clients at multiple practices in Southern California said they were "Very Interested" in a rewards program. and invest more in their pet's health when you do. In a study conducted by Vet2Pet™, practices saw an average increase of $91k in annual revenue after launching a Rewards Program (more about Vet2Pet and their app in the FAQ). So we created kits to help change that. I spent nearly a decade at billion dollar tech companies, designing everything from patented digital experiences, to world-class human-to-human interactions. And I can tell you, the best solution to a problem isn't always the fancy technical one. Sometimes, the best user experience is the one you can touch and hold in your hands, and form an emotional connection to. And when it comes to a reward program, there's something so delightful about being able to hold a card in your hand. I started Vetfini to bring my expertise in "experience design" to the veterinary industry. While at Apple, Hulu, and CBSi, I designed and delivered many aspects of our user experiences. Everything from person-to-person experiences, to the patented digital experiences used by millions of customers. They include all the supplies you'll need. All designed to keep clients coming back. It starts with cards worth treasuring. With an elegant stamp card on one side and a useful nametag on the other, these cards are meant to be kept around. They're printed on smudge-resistant cardstock and have smoothly rounded corners to help keep them looking great. Each order is professionally designed using your practice's logo & colors, so they'll match your branding. Then you put your paws all over them. For every $100 a client spends during a visit, you give them a stamp on their card. You'll find that many clients will add food or toys to their invoices in order to basically "round up" to that next stamp (especially when they're within a few dollars of reaching it). For long-lasting durability, the stamps are designed to last 50,000 impressions before needing more ink. And to make it a breeze to neatly align each little paw print, the circles on the cards are even matched to the size of the rubber stamps themselves. By giving clients a way to attach their cards right to their carrier, you avoid the "I forgot my card" problem and give your clients something useful to hang onto. And for those clients who don't have a carrier to attach the nametag to, the cards are even designed to be the exact dimensions of a credit card – so they fit neatly in any wallet. Start rewarding your clients, their pets, and your practice. The idea behind the program is pretty simple – when you thank clients for their business in meaningful ways, they're more likely to give you their business again. So, for this program, when a client collects 16 stamps on their card, you thank them with a $100 credit towards a future visit at your practice. This valuable reward gives them a compelling reason to keep coming back, especially as they get closer to reaching it. You'll find that many clients will even look for ways to get to the reward more quickly – which presents a powerful opportunity to incentivize certain activities that benefit both their pets and your practice (click "Bonus Opportunities" for more info). Wouldn't it be great if clients brought their pets in for their annual exams every year? Or referred all their friends and family to your practice? Or tried out other services? The key behind launching a successful rewards program is making it simple and compelling. So, we've worked hard to create something that is both easy to explain and understand, while being compelling enough to drive repeat business. For cat-specialty practices or those that primarily see small animals (cats, small dogs, pocket pets) that travel in carriers. For high-volume practices with a split of small and big animals. Ready to give your revenue a boost? Place your pre-order today to lock in your special pricing and get a spot in line. No payment required today. Within a few days of your order, we’ll send you a survey so you can share some details about your practice (including your logo). After we receive that, we’ll design your cards and send you a proof to approve. When you’ve approved your designs and completed payment, we’ll get to work manufacturing your kit. We’ll be building up our stock over time, so this timeframe should shorten as we get more orders. We’ll be shipping in the order we receive payments. In most cases, you will receive your kit within a month of pre-order. Can I customize my program to be based on visits or a different numbers of stamps? How much will it cost when I need more cards and nametag holders? We're still working out the details of what the refill packs will include and cost. However, we do know that they will cost less than the full-price of the regular starter kits. How much will it cost when I need more ink? Absolutely nothing. Just reach out to let us know you're running low, and we'll send you a free refill of the ink. Keep in mind, the ink in the stamps should last 50,000 impressions before running dry – so you should get a couple years use in most cases. Why would I want to base my rewards program on physical cards rather than an app? This is a fantastic question, especially since apps are all the rage right now. Physical Reminders. 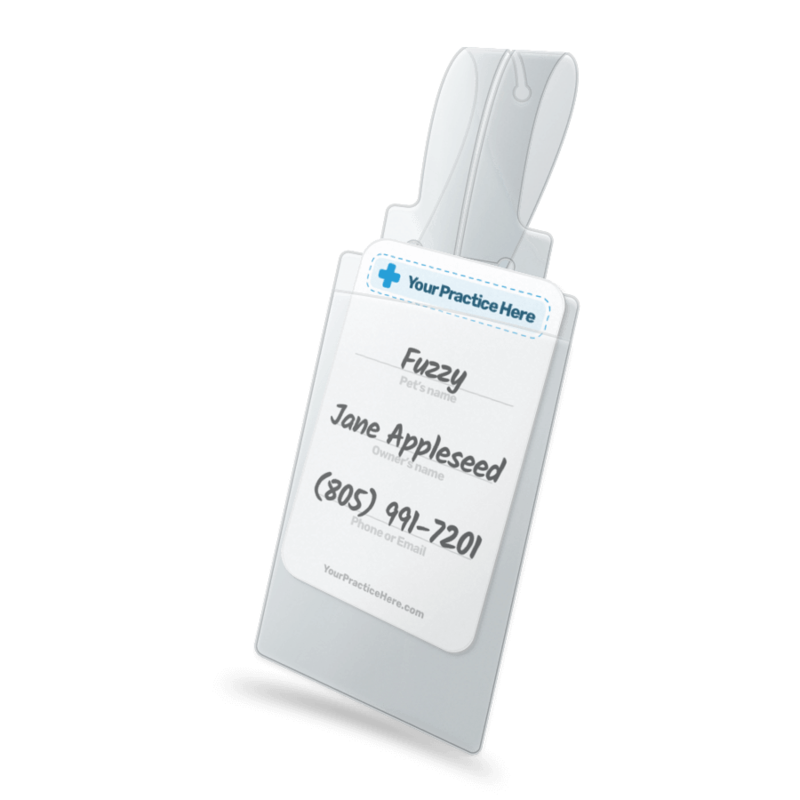 By attaching the cards to a client's carrier or leash, any time the client goes to take their pet somewhere (even if that's – gasp – a competitor), the cards will remind them about your practice, as well as all the stamps they've accumulated already. App Overload. Many people are suffering from "app overload" since many local businesses are offering their own apps (sometimes with loyalty programs as part of them). However, of all the apps that people download, only 1% are ever used after the first day – the rest are basically forgotten about. In fact, in a study we did between a few veterinary practices, more clients explicitly "did not want" an app for their practice than actually did. So it's definitely something you should think carefully about – we suggest surveying your clients, as you might be surprised what they say. These are just a few reasons. If you're on the fence, it's probably worth doing a pro/con analysis of the benefits of card-based and app-based rewards programs. We're also happy to hop on the phone with you to discuss any questions you have (No hard sales-pitches. Promise. ). Vet2Pet is a veterinarian-owned company dedicated to helping practices connect with clients and take better care of their pets. They do this by building an app for your practice that incorporates a variety of neat features. For instance, clients can request appointments, receive push notifications about their pet's status, request food and prescription refills, submit selfies, and there's also a built-in loyalty program. We reference them here because they have been kind enough to release an annual "Loyalty Program Report" that quantifies the impact that loyalty (or rewards) programs can have for clinics. 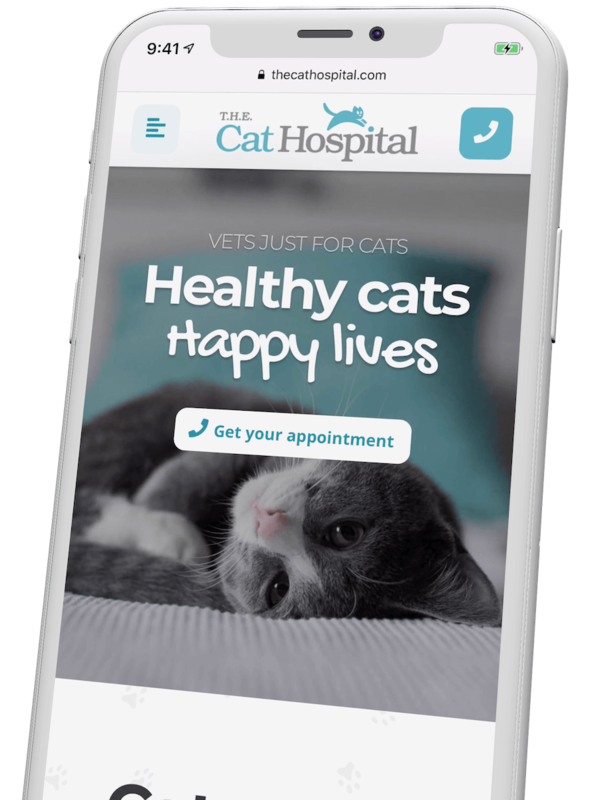 If you're interested in learning more about them and the features of their app, check them out over at vet2pet.com. To be clear, we are not affiliated with Vet2Pet (other than admiring their work). We're sharing all this info because we want you to make the best decision for your practice. If you really want an app, you should take a look at what they offer. If you're not quite ready for that, but want to get the benefits of a rewards program now, our kits can help. Are the kits manufactured in the USA? You betcha! All the major parts of the kit are manufactured in the . The cards and stamps are designed, printed, and manufactured in ☀️ Southern California. And the nametag holders come from just outside of Boston, Massachusetts. Get in touch! We're happy to answer any questions you have. Created in veterinary practices. For veterinary practices. Like many new products, this one was born to fill a personal need. After spending nearly a decade at major tech companies like Apple, Hulu, and CBS Interactive, I decided to bring my expertise in building innovative customer experiences to the veterinary industry. And having literally grown up in my family's cat hospitals, they were a natural place to start. I began by regularly surveying my father's clients to measure their customer satisfaction and see where we could improve their experience. And what became immediately clear was that a lot of his clients reeeeeally wanted a rewards program. "Sounds easy enough", I naively thought, and began researching products that could help us launch one. Instead, what I found were complicated loyalty programs originally designed for restaurants, or apps that bundled a rewards program with other features we didn't currently need. Ironically, one of the lessons I learned during my time at billion dollar tech companies is that the best solutions aren't always the ones built around fancy technology. And for a program where your goal is to foster a longterm emotional connection with clients, putting a useful physical object in their hands actually makes a lot of sense. So, I set about creating something to meet those needs. After months of research into rewards program best practices & the psychology behind them, I began building and testing prototypes with several manufacturers. After fleshing out the details of the program with my father's team, we landed on something both simple and powerful. And rather than keep everything I learned at just one practice, I decided to release these kits to help veterinarians just like my dad. I know your clients will love them (and so will your accountant). What's your role in the practice? When are you hoping to start your rewards program?